The Quest for Inter-City train is done! My project to build the classic 1980 LEGO Train, the 7740 Inter-City Passenger Train (12V), from new and old parts is complete. See also: Best of times, worst of times and 1980 LEGO passenger locomotives for accompanying comments on finishing the train. The build starts with the locomotive and placing the 12V light bricks as well as cabling inside. As someone who only had some 1960s 4.5V light bricks as a child, it was a fun start to use these more “modern” light bricks (now 30+ years old themselves). A screwdriver was needed to tighten those 1980s LEGO power cable connectors. 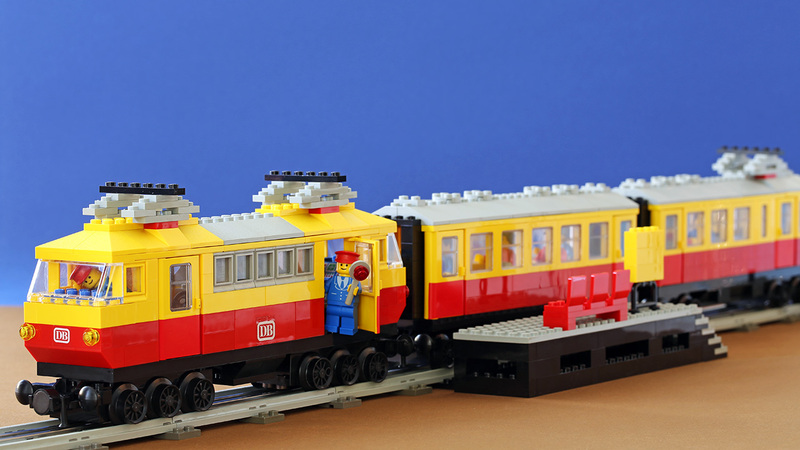 The locomotive then went on with the sides, including four BrickLink acquired pieces (light prism holders and the two side weights) that had genuine 1980s Deutsche Bahn stickers on them – these would be the only stickers going into this re-creation, but they do add a nice touch. Having the bricks mostly in plastic boxes (sorted by color and/or origin) helped a great deal in building. I just picked up the respective box, picked the parts for the section I’m building, put the box back and moved on to the next color and putting the bricks on the train. I have to admit, it was really great to see the locomotive take shape. The engine looks real nice from the grey side windows for example. The bigger wiring holes on the modern train baseplate luckily didn’t affect the build at all. One part where I cheated a little on the train, were the six 4×12 yellow plates underneath the roof: I had 4 of those plates from the 8680 Arctic Rescue Base and then improvised 2 more from four 4×6 plates from the CUUSOO Hayabusa. To give you some idea of my building speed, the first attempt at the locomotive took around an hour and 15 minutes (later I put on some finishing touches to it and the train, though), where as the rest of the train – two wagons and station platform – took only an hour total. The locomotive is the most detailed one, of course, but also speed picked up as I went forward. Next to the heavy locomotive, the wagons felt almost flimsy without the weights and the 12V motor. Otherwise the wagons were a nice part of the build, with more detail going into them than in the 7710 Push-Along Passenger Train I had as a child. The restaurant wagon, of course, is especially nice in 7740 and breaks the monotony of building two identical wagons. By the way, the restaurant wagon presented a surprising part problem – requiring two old grey 2×2 sloped roof tiles, to my surprise a rather stingily used part in the 1970s-1980s where my collection hails from. This is one of those things with LEGO, sometimes the simplest part turns out to be rare. I had just two of those, from the 886 Space Buggy and 926 Command Centre probably, and one was already in my 6080 King’s Castle re-creation. I borrowed. While the new, slightly larger wiring holes in the modern train baseplates don’t interfere with the wagon builds either, they do leave quite scary-looking holes inside the train (visible only when removing the roofs and peeking inside). I wouldn’t want to travel in a train with a couple of large holes in the floor myself, but my minifigures didn’t seem to mind. That would, of course, be fairly easy to fix by attaching a stack of plates from underneath, but I chose to leave them as is, because all the interior fits in their correct places without modifications. Above: See Waiting for train for a few comments on building the station platform. The station conductor minifigure actually isn’t supposed to have a transparent red round brick attached to the signal holder. Originally the rear of the signal holder was covered with a white/green sticker and I believe the other side left plain. 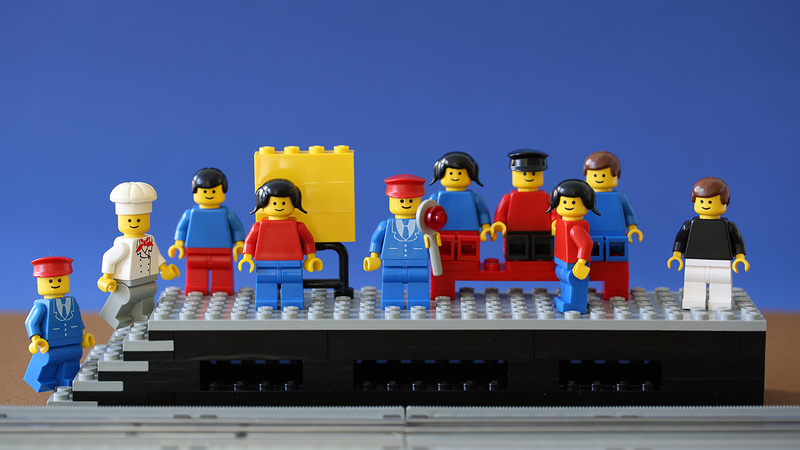 I got the idea from a 1980s LEGO Trains commercial, see Trains commercial. Around 19 seconds into the video, the station conductor is seen with a white holder and a white/red sticker, something I haven’t seen in actual sets. At around 23 seconds, though, he is seen with a red round brick attached to the signal holder. 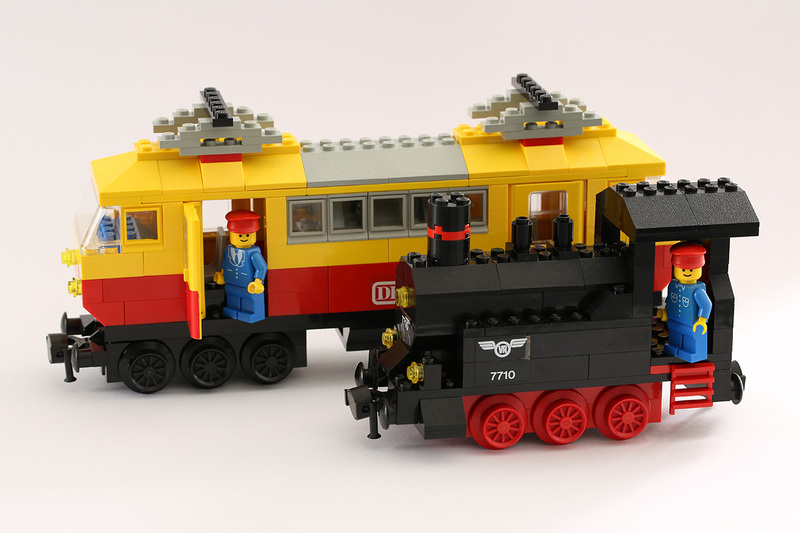 One of my ideas, but also concerns (see Taking stock, LEGO ages like wine) was to use a combination of new and old LEGO bricks for my 7740 Inter-City Passenger Train. Idea because I wanted to see how much new you could get and also to get away from the monotony of LEGO washing. Concern, because I knew not all parts would be available new (turns out 51% percent were) and the end-result would be a mix of new and decades old bricks, some over 30 years old. Would it look like a Frankensteinian monster, different types of parts clashing badly? Turns out, it doesn’t. Actually, the train looks pretty freaking awesome and a little scarily like it just came out of a previously unopened box. You can tell from slight discoloration and small dings in some of the old grey bits that they aren’t new, many of them are from my childhood collection, but mostly the train looks very glossy, very shiny and all-around new. 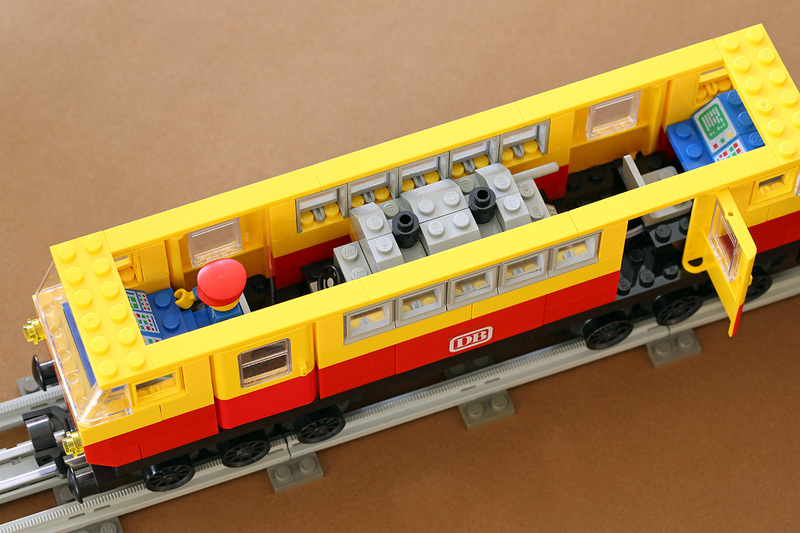 Old yellow and red train parts (those that weren’t available as new), blend in well with the new bricks. I also had some luck in getting those yellow and red parts mostly in quite good condition, but I don’t think that’s the main reason – old LEGO just blends with new quite well. (Not perfect, but well.) One point here is that the ABS plastic LEGO has used since the 1960s really retains color well. So, what happens to the train now? As you may recall, the 6080 King’s Castle I built in a similar “quest” I am going to gift to my son for Christmas. I look forward to sharing some of the LEGO of my past with him. Unlike the castle, which I have kept a surprise, I have shown parts of the 7740 Inter-City Passenger Train and other old LEGO Trains pieces to my son, explaining him the push-along models and 12V and stuff like that. He was very interested and went on to try “if the magnets still worked” – they did. As it stands, the train isn’t ready for gifting though, not least of all because it lacks a real track to run on (I only have a little stretch and some accessories). If my son shows more interest in my old LEGO later on, I’ll be glad to expand on this. I think dumping too much on him in an instance would devalue the experience. He already has maybe a quarter of my old LEGO, which is great, but more without the context would do him a disservice. So, I’ll wait and see. Moderation is the key here. Another idea I got for the train, if my son isn’t interested or until the right time for him, is to display the train at home. Unlike the 6080 King’s Castle, which didn’t really seem practical as a display, the compact format, but still impressive size, detail and sturdiness of the 7740 Inter-City Passenger Train really looks like it could do well on a shelf somewhere visible. The fact that the train is so shiny and new in many parts adds to this. I didn’t expect the 7740 Inter-City Passenger Train to look as impressive as it does. It is really quite imposing. I’m very, very glad I finished it. P.S. YouTube has a great video of building the train from the original set.